This particular pump takes its suction about 20 feet below the surface of the Arabian Gulf, where the water is a relatively cool (more so than surface water) and relatively free of suspended solids. There is no chlorine injection at this location. Intake filters have removed major trash, grass and suspended solids. The pump, operating at 5500 rpm and 120 psig discharge pressure, operates for one week and lies fallow the next. A sister pump (diesel-driven) shows no such attack, even though it operates for only 30 minutes a week (much longer stagnant conditions) and you consider critical stagnation periods to be about two weeks duration. 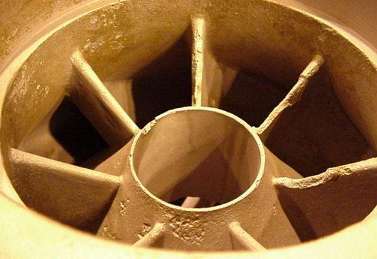 Two sister pumps, side-by-side with the corroded pump, are unaffected. There seems to be no sources of local contamination peculiar to this particular pump. Although production requirements are such that no destructive examination is possible, you asked whether carbide precipitation (sensitization) or microbiologically influenced corrosion (MIC) might be factors in the corrosion. The combination of sulfides and chlorides (from SRB action) can be deadly but no more likely in this than in its sister pumps. It certainly looks like that pump had seen at least thirty days or more of stagnant conditions at some time in its life. 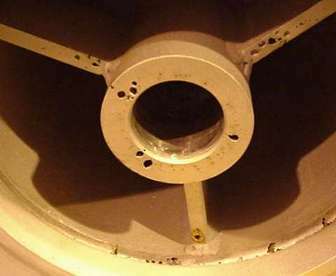 The photographs illustrated localized corrosion, especially as pitting but with some apparent erosion, on the inside of the Type 316L (UNS S31603) pump column spools. There is also deep pitting of the bushing housing and support and in the heat-affected zone of the spool flange welds. There has also been pitting on internal surfaces of a Type 904L (N08904) pump bowl, as well as erosion-corrosion of the tips of the volute. It is true that pitting is more prevalent in sensitized area, such as besides welds (especially if heat tints have not been removed. However, in our opinion, a more likely explanation would lie in surface contamination by iron (from fabrication, shipping or handling) or the presence of sigma phase or "coring" of dendrites in Type 904L weldments. It is believed that this sort of installation should have been cathodically protected by either sacrificial anodes (e.g., iron or zinc) or by an impressed current system. Since you must preserve the pump because of immediate needs, we recommend that you solicit the aid of the cathodic protection experts in the Corrosion Control Group in Dhahran. This approach should be applied to all the seawater pumps, in our opinion. Repair welding should be effected with Alloy 625 (UNS N06625) or Alloy C276 (N10276).